In 2006, Rush began writing material in earnest for their follow-up to “Vapor Trails” and “Feedback”. Alex and Geddy worked from the home studios in Toronto, while Neil contributed preliminary lyrics from his and his wife’s new home in Southern California. About halfway through, they brought on Nick Raskulinecz (a lifelong Rush fan) to produce. Raskulinecz already had a lot of prominent credits under his belt, particularly with bands like Foo Fighters and Queens of the Stone Age. He encouraged Rush to push their limits as musicians, encouraging them to take pride in their skills and indulgences. I confess I was worried before “Snakes & Arrows” came out. While it’s not a concept album, it’s one of the band’s strongest thematic albums, something I always felt Rush was stronger at than concept records. The songs focus on various forms of “faith”, whether it be finding it, keeping it, losing it, etc. You can tell the band was inspired by playing 60’s protest songs on “Feedback”, because the songs also have an air of protest music, with more acoustics than ever. After trying to get away from their dry synth sounds of the 80’s, this feels like the fullest realization of the band getting “back to basics”. …Oh, and Raskulinecz also showed a firmer hand in the mixing than what the band had done on “Vapor Trails”. All the parts are crystal clear with dynamics rarely squashed and with very little clipping. Already off to a good start! One thing this album undeniably gets right is its opening song, “Far Cry”. I’m not kidding when I say this song is up there as one of my all-time favorite Rush songs. I listened to this song a stupid amount of times when it was released as a single. The riff is big, heavy, and memorable, sort of brilliant in its simplicity. The jangly bits during the verses and the solo feel like more realized versions of what they were going for on “Vapor Trails”. The lyrics are also some of Neil’s best. If “Snakes & Arrows” is about faith, this song establishes from the get-go that keeping the faith during dark times is always a challenge, but it’s one we must meet. “One day I feel I’m on top of the world/And the next it’s falling in on me/I can get back on/I can get back on”. 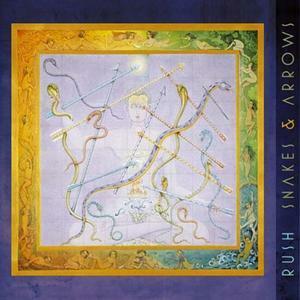 Neil came up with the title for “Snakes & Arrows in the first lyrics of “Armor & Sword”: The snakes and arrows a child is heir to/Are enough to leave a thousand cuts”. It talks about the idea that children aren’t born with a set faith; faith is taught by parents just as much as social skills and language, and this can be tied to hatred and war. The song itself is one of the most lush on the record, with the acoustics and guitars equally swelling and chiming, making the song both heavy and tender. As I said before, Rush took a lot of inspiration from covering 60’s protest songs for “Feedback”, and “Workin’ Them Angels” is one of the songs that has the most similarities (down to the mandolin solo from Alex). Neil references his cycling trips through Africa, no doubt talking about how any successful venture takes a little bit of luck. Another real song track. “The Larger Bowl (A Pantoum)” continues the “protest feel”, with Neil pondering “If we’re so much the same like I always hear/Why such different fortunes and fates?”. Part of my problem with “Vapor Trails” was that the mix and composition had an “everything and the kitchen sink” approach. Songs like “Larger Bowl” show a much firmer hand, keeping a consistent and thus more melodic tone throughout. The mood is beautiful, and the solo is soaring. “Spindrift” opens with an ominous tone not unlike “Witch Hunt” from long ago. The riffs are huge on this one, but the lyrics have shifted gears. Neil has commented that instead of faith and injustice, this song was more about a relationship falling apart. If that’s the case, it’s a bit of overkill considering the subject matter, isn’t it? It’s still a good song, but it feels a bit much. “Snakes & Arrows” as an album can brag that even if it doesn’t have the best Rush instrumentals, it has the most, tipping the scales at three. The first and best is probably “The Main Monkey Business”. The band said it took them days to record, but even if that’s true the performances still feel natural, almost like the band was jamming in the studio. Keyboards are lightly re-introduced in the form of an analog mellotron, and for once Geddy’s voice is used as an instrument unto itself. With the shift between acoustics and electrics, between ethereal and intense, and the increases and decreases in tempo, it’s pure musical gymnastics on the part of the band. “The Way The Wind Blows” opens with a militaristic drum march before Alex busts out some of his straight up bluesiest playing. Things lose steam a bit for me after that though. Lyrics are a bit weak for me, especially with references to “Middle East to the Middle West”. As always, I hate it when Rush gets too on-the-nose with their subject matter. While I say “Main Monkey Business” feels like Rush jamming in the studio, I can tell it was most definitely cobbled together from several takes and overdubs. That’s part of what makes “Hope” such a rarity: it’s Alex Lifeson playing his acoustic guitar alone (none of the other band members) in one perfect take. It only lasts two minutes, but it adds an undeniably beautiful and bright spot of…well, hope during what’s otherwise a dark and contemplative album. Another lush track (particularly during the choruses and bridge), “Faithless” makes it clear that while Neil has no specific faith, I feel he’s far from an atheist. There’s enough pondering and philosophizing on his end to show that some spiritual component exists in him. It’s best to consider him a secular humanist, which generally acknowledges how horrible man can be, but that we can find decency just the same. Alex’s playing is brilliant on this one, remaining low key until he busts out the solo. “Bravest Face” opens with more lush orchestration, but it quickly falls apart. Neil’s lyrical connections are really weak and frankly beneath him. Lines like “I like that show where they solve all the murders” and “In the sweetest child there’s a vicious streak” just make me roll my eyes. Probably the weakest track thus far. The flange effects that open “Good News First” feel old hat, and I don’t care for the manipulation on Geddy’s voice. Alex’s light echoing flourishes from the periphery are interesting, but don’t amount to much. Lyrics aren’t as bad “Bravest Face”, but aren’t particularly memorable. Things pick back up for the last instrumental: “Malignant Narcissism”. If “Hope” was Alex’s showcase, this is Geddy’s for how dominant his fretless bass is all over it. The tone reminds me of some of the darker funk indulgences, like on “Where’s My Thing?” and “Leave That Thing Alone”. The “Team America” sample that gives this song its name is a delightfully surreal cherry on top. I still prefer “Monkey Business”, but this one was a lot of fun. The album closes strong with “We Hold On”, which has a twangy, Wild West feel to it. Lyrics sum up the basic message: life tries to beat us down, but best we can do is have faith and move on. I don’t have much else to say about this one other than that, but it’s a pretty good track. “Snakes & Arrows” loses some momentum in its last quarter, but overall I really enjoy it. The band clearly learned from their mistakes on “Vapor Trails”, and while they could have easily rested on their laurels after re-uniting like so many bands do, they continued to chart new territory and push their songwriting and musicianship. I only hold back rating it higher because of how much I like its successor. WEAKEST LYRIC: Anything from either “Bravest Face” or “Good News First”. I still don’t like that “Middle East/Middle West” line from “Way The Wind Blows”, but its otherwise a good song so I give it a pass. MY RATING? Great, but just short of essential.